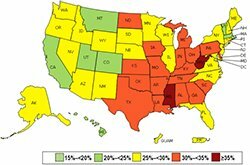 For statistics behind America's obesity epidemic, visit the CDC. For what to do about it, read this page. Read 20 FACTS ON OBESITY and be stunned. These facts about obesity are different than most. I didn't learn them from a book. But from real life experience helping people live a naturally thin life. This list takes exception to much of the misinformation being prescribed by weight loss professionals, when it is clear those methods have dismal success rates. The best way to lose weight is individual preference, not forced behavior. You do not have to eat a nutritionally balanced diet to lose weight. This list reveals many valuable insights and facts about obesity, weight loss and living a naturally thin life. You will see that past dieting failures were not entirely your fault. But the fault of the dieting extremes you were expected to endure while losing weight. Use these 20 FACTS as a learning tool. While reading, if you find yourself nodding your head in agreement or hear yourself thinking, "That's right, I know that's true," or, "Yes, that sounds just like me," you will know the solutions suggested are practical and doable. The following 20 FACTS tell you what a healthy diet plan really is. Why it's not a diet. How you can lose weight without food cravings or plateaus. What it means to be naturally thin. Obesity problems for women, dangers of childhood obesity and much MORE! This list provides valuable and useful information that encourages you to reach and maintain ideal body weight. And live a naturally thin life free of weight issues. Obesity defined by BMI, waist size, physical limitations and personal psychology. Facts about obesity reveal relationships between obesity and major health issues like heart disease, stroke and diabetes. A preponderance of evidence proves dieting causes obesity. Chronic dieting and a sedentary lifestyle are related. Fans of fast food will love this. Food police propaganda is exposed and solutions offered for eating at fast food fat factories. Learn how to save mega calories. The truth revealing why weight loss is more difficult for women than men. Most productive age for weight loss for women. Why age is a major influence. Dangers of Childhood Obesity & What You Can Do About It! Few facts about obesity make me cry. These do. Devastating. Diseases and psychological ruin. An entire generation discarded with a soft drink diet and video games for exercise. 14% of Americans, 2-5 years old, are overweight. That's our fault. Components of a healthy diet plan for teens plus 29 Teen Weight Loss Tips for parents. How to talk to your teen. What to say and how to say it. How to help teens define their best way to lose weight. Directed and autonomous motivation defined. Weight loss motivation myth. Drawbacks, limitations and solution. Law of Reverse Effect and why weight loss motivation leads to bounce back regain. How to avoid weight loss plateaus completely. Why plateaus occur. Do they damage your weight loss effort? How to lose 9.75 pounds per month with a healthy diet plan that virtually eliminates plateaus. The necessity of flexibility. Components of the best weight loss plan. Four phase sequence of weight loss success. The difference between lasting weight loss and living thin naturally. A must read for the diet veteran looking for the real reasons why past diets failed and a workable solution to reaching and maintaining ideal weight. Fast weight loss defined. What is too fast? Consequences of fast weight loss. Dieting dangers of fast weight loss. The best way to get fast weight loss. Unrealistic claims and easy weight loss tips that actually do speed weight loss. The weight loss maintenance myth. Support and motivation not needed with right healthy diet plan. Maintain weight like you maintain your teeth. Statistics prove weight loss maintenance, diet buddies and support groups fail. 93-97% of those who lose weight will regain every pound within five years. Pollyanna nutrition deception. 10 Food Myths. Can coffee help you lose weight? Do you have to starve to lose weight fast? Why weight loss is easy. That's right! I said it, EASY! What is naturally thin, how to get it. Only logical dieting alternative. The 3 options and real solutions to America's obesity epidemic. Why naturally thin people never diet. Naturally thin myths and realities. Burn 90 calories in one hour listening to music. How dopamine can help you lose weight. The best way to generate dopamine. What dopamine is and why it's beneficial to any weight loss effort. How to find quality newspaper articles on obesity. 14 Internet and newspaper articles reviewed and links to each article. Facts about obesity are abundant, all in a quest to discover the best way to lose weight. "Why it's the wrong question to ask. Reasons why people are fat, identifiable symptoms of obesity. What you can do to begin living a naturally thin life. Why there is nothing wrong with you and why your weight problem is not entirely your fault. A scathing indictment of health food junkies. What can happen when you pursue wellness via dietary purity. Eating disorder or cult. Do you know any who suffer health food junkie orthorexia nervosa symptoms and attitude of superiority. Food police sickness. How to virtually eliminate food cravings. What really determines the best way to lose weight. Food cravings and addiction. Lose 36 pounds in 12 months with 3 minor diet modifications. Best way to lose weight and keep it off is live a naturally thin life AND NEVER DIET! Why a healthy diet plan is different than a diet. How to define a real healthy diet plan. Perfect nutrition vs. healthy diet plan. The 29 pound Snickers bar and easy weight loss tips. The best way to lose weight is live a naturally thin life. The best way to live a naturally thin life is to live a physically active life. Combine a physically active life with a smart healthy diet plan and you discover not only the best way to lose weight, but the only way to keep it off. 20 FACTS is designed to introduce you to a real alternative to dieting by pointing out the facts. After you read this you will identify many past weight loss and dieting mistakes. Hopefully, it will convince you dieting fails and is a complete waste of time. Read the 20 FACTS and discover weight loss tips and opportunities galore. Much of the information presented comes directly from participants in my weight loss programs. When you read something on my list that is contrary, different or opposite of what you 've been told or lead to believe, simply ask yourself if what I describe fits your experience. Then you decide. 20 FACTS was designed to be used as a whole, not 20 separate parts. As a whole, the list tells a complete story offering multiple opportunities for weight loss success.